365 Project – Day 243 – Do Dogs Dream of Rabbits and Treats? I’ve always been fascinated by dreams, and I don’t mean the someday I dream of writing more bestsellers than Stephen King kind of dreams. I’m talking about the standing naked in front of the classroom, falling off a cliff, being chased by an invisible monster wearing cement shoes and a technicolor coat sort of dreams. I’m talking about the dreams that haunt us while we sleep, playing behind our eyelids in bursts of disjointed scenes and vaguely recognizable characters, dreams leave us confused and sometimes downright dizzy when we awaken. Sort of like the movies Cabin Fever or The Happening–you know there is something going on, maybe even something important, but you just can’t seem to unscramble the mess and figure out what it is. My dream obsession likely stems from the fact that one of my earliest memories is a dream I had when I was just 4 years old, a dream that was so vivid that I somehow managed to sleepwalk out of my room, through the kitchen, down the stairs on the back porch to the back door. I remember standing at the back door, looking out into the moonlit darkness, watching a blondish woman walking near our garage, as though she was searching for something. In the dream, she was my mother, and I knew she was looking for me. Frantically, I unlocked the door and opened it. I had taken one step outside when my Mom caught me, woke me, and took me back to bed. Yeah, that dream stuck with me. Eight years later, I found out I was adopted. And ten years after that,when I met my birthmother for the first time, I couldn’t help noticing that she looked an awful lot like the woman from my dream. In high school, I studied different theories on sleep and dreams. I even kept a dream journal for several years, where I learned that I often dream of my teeth crumbling and falling out whenever I’m having trouble in my personal relationships, and I dream of tornadoes and tend to sleepwalk and sleeptalk when I am overly stressed. When I taught high school English, I opened my unit on Shakespeare’s Julius Caesar with an introduction to dreams and a great little visualization exercise called “The Cube” to help my students better understand the power of dreams and symbolism. I had to smile at the way their eyes widened in shock and disbelief as we worked through the exercise. And I laughed as several of them called me “Miss Cleo” for weeks after. For anyone who thinks that dreams and the symbols within are just a bunch of hokey garbage leftover from the events of the day, I dare you to keep a dream journal for a few months and keep notes about what is going on in your life at the same time. You just might be amazed at what your sleeping mind is trying to tell you. That being said, I find myself wondering, just what is it that my dog, Electra, dreams about? 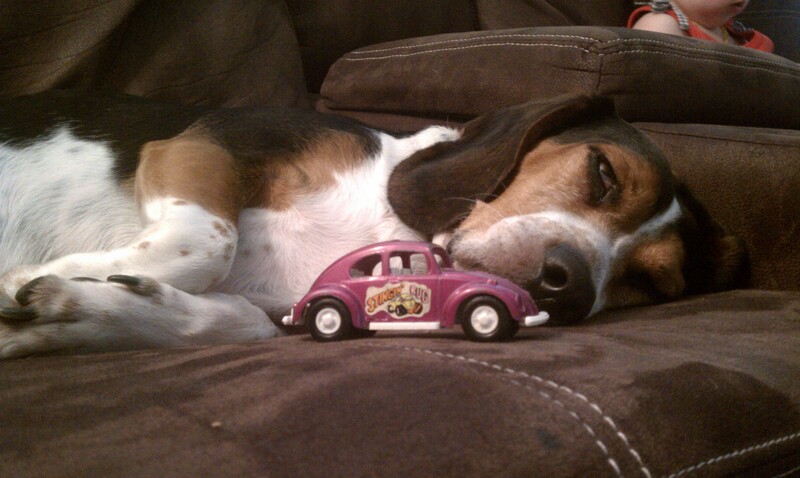 In this case, she may have dreamt that she landed in Lilliput and was being terrorized by the mini-citizens driving their motor cars up and down her spine, thanks to Cadence deciding that our dozing hound made a perfect racetrack for her little purple car. But what about all the other dreams? I mean, I’ve owned and been around dogs all my life and I’ve never known a dog that dreams as often or as dramatically as Electra. It starts with a huff and a puff and some twitching. Her tail begins to thump rhythmically. Her eyes roll around, and sometimes even open completely. She snorts and wheezes and whines. Sometimes she barks. Sometimes she growls. And, on several occasions, she has scared Steven and I out of a dead sleep by howling loudly and sounding almost human. One night, we both swore we heard her yell, “I need squirrel!” in frighteningly plain English. Since then, she can pretty much sleep wherever she wants. Because if she knows how to speak coherent English, then we’re pretty sure she has the capacity to gather a canine army and take over the world if she ever gets motivated, and we want to make sure we stay on her good side. If that means occasionally waking up to find her droopy face sharing my pillow, that is a sacrifice I am willing to make. I just wish could get a glimpse what she is seeing behind those tired doggy eyes. Tonight’s 365 Project entry is dedicated to our dear dreaming Electra. Sleep well, my pet. May your dreams be filled with slow-moving bunnies and mountains of peanut butter treats.